Basically this cuisine can never be defined under one term that is “Indian Cuisine” just like Chinese cuisine. 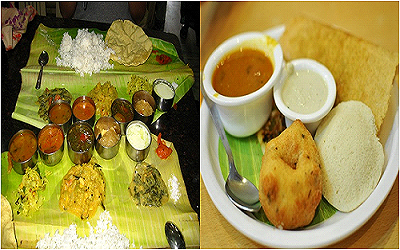 In India every state has different food habit depending upon the climate and palate of that particular region. South India is mostly known for its rich, tangy and spicy food especially meat and poultry, whereas North India is known for its Kebabs and other meat delicacies but less spicy compared to South India. 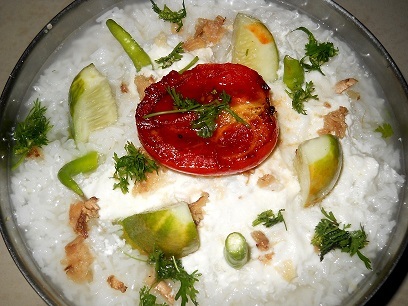 Similarly east is known for rice, fish, and sweets and west is famous for its street food, meat and chapattis. 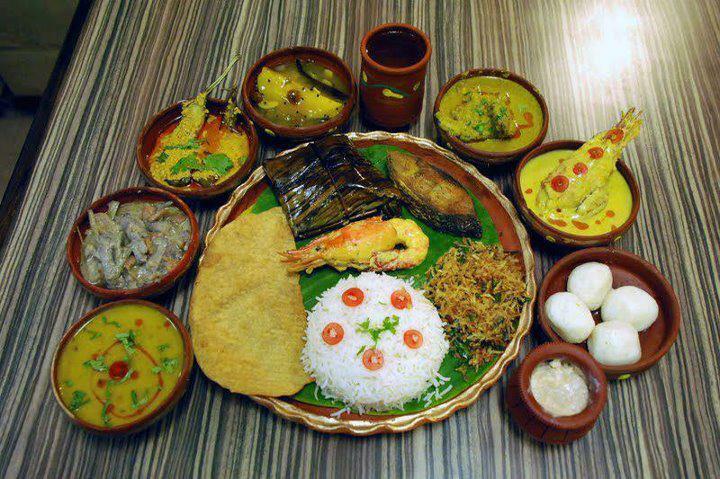 Again Indian cuisine cannot be dived on the basis of region, it can only be classified under each states as every state has its unique food habit and culture. Basically, distinct regions based on the topography comprise India. Lying at India’s northern border with China and Nepal, the Himalayan Mountains, the world’s highest mountain range runs through the extreme northern section of India. The climate in these snow-capped mountains consists of cold winters and cool summers, conducive to growing many crops, including fruits and walnuts. Abundant mushrooms grow wild in this terrain. South of the mountains, the land changes to plains, valleys and rivers. The Ganges and Indus rivers run through this area, providing rich soil for fertile farmland and a bounty offish for consumption. Most of the people of India reside in this region. The east consists of fertile plains and coastline. Abundant seafood and fish are available here, and ample crops include rice, coconuts, and many vegetables. Eastern India receives abundant rainfall; in fact, some of the highest measured rainfall found anywhere occurs here. Contrarily, hot, arid land with desert conditions describes the land in the west. Seafood from the coasts dominates the diet of those living in this region as significantly fewer crops grow here. The central-southern portion of the Indian peninsula, called Deccan, contains plateau in the center, surrounded by mountains on the east and west, with coastal plains lying between the mountains and the coast. Tropical conditions and jungles predominate in the south. Much of this land is fertile farmland, yielding all sorts of grains, including the famous basmati rice, wheat, corn, millet, and barley. Legumes and many vegetables flourish in this region. Lying near the equator, the extreme south experiences hot, humid, tropical weather with seasonal monsoons, or seasonal rains. Seafood, fish, coconuts, bananas, and a myriad of tropical fruits and vegetables flourish in this climate. The cool season of the fall and winter, the hot season existing in the spring and the rainy season found in the summer. The cool season means cold weather in the mountainous areas, but temperate, warm, or hot conditions in the other regions. In particular, the southern regions experience extremely hot conditions during the hot season. The monsoons have an enormous effect on the crops making India susceptible to both flooding and droughts, which often lead to crop failures and starvation. Grains include Rice, wheat, Arahar dal, Masoor dal, etc. Vegetables including spinach, cauliflower, peas, pumpkin and sweet potatoes, potatoes, tomatoes, eggplant, Bitter gourd, bell papers, etc. 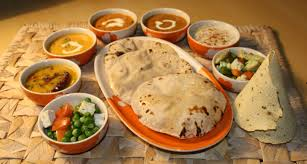 Breads include chapatti, paratha, naan, poori, roti. Masalas include garam masala, panch phoran, haldi, etc. In the early days, much of the food was either grilled over an open fire or cooked in a pot placed in the embers of the fire. Of course, this one-pot cookery resulted in stew like curries and was perfect for the long, slow cooking needed for legumes. To extend the available meat, the tender cuts of meat joined vegetables on a skewer for grilling, and the tougher cuts entered the pot for braising– the slow cooking method necessary to make them tender. Baking in the tandoor oven occurs most frequently in the north. This clay oven becomes very hot from fuel of wood or charcoal, and it is used for cooking meat, poultry, seafood, fish, or vegetables on skewers, as well as for baking flat breads. Skewered foods are marinated in a yogurt and spice mixture before cooking, then the skewers are lowered into the vat-shaped oven. Flat breads are slapped against the inside walls of the hot oven where they adhere and cook quickly. Stir-Fryingremains a popular cooking technique in India, particularly with the large number of vegetable dishes served throughout this country. Like the Oriental wok, Indians use a deep pan with a rounded bottom and handles on each side called a kadhai. Another pan found in Indian kitchens, the tava is a slightly concave griddle made of cast iron. Frequently used for sautéing, several varieties of flat breads are cooked on an non-greased tava. Deep-Frying also appears regularly in this cuisine. Steaming remains one of the most frequently used cooking techniques used in the south. Often, banana leaves enclose the foods to be steamed. Like the tamale of Mexico, leaf wrapped foods were placed in the embers of the fire for steaming in the past. Today, large and small steaming pots are standard equipment in most southern Indian kitchens. With many rivers and lots of ocean surrounding this peninsula, fresh seafood and fish abound. Seafood preparations include frying, baking, poaching, grilling and steaming. The preservation of fruits and vegetables is commonplace throughout India. Pickles and chutneys (intensely flavored, spicy relishes) function as an import part of the Indian meal, as well as preserving the bounty of fruits and vegetables for meager times. Drying foods occurs in the mountainous north where harsh winters limit the growing season. Another preservation technique, salting, is frequently employed to extend available food supplies for times when less is available. Hindus, Muslims and people of numerous other religious sects live in India, each possessing their own philosophies and dietary laws. Muslims do not eat pork. Hindus consider the cow a sacred animal, so they don’t consume beef. In addition, Hindus believe in reincarnation, so many abstain from eating any meat. Jains, members of another eastern religion that developed from Hinduism, believe strongly in reincarnation. As a result, followers of that religion don’t eat meat, fish, poultry or eggs because that animal could have been a person in another lifetime. Many also refrain from eating root vegetables because digging them might injure a worm or other underground creature. They abstain from red foods such as tomatoes and beets because the color is reminiscent of blood. As a result of the numerous religious restrictions on meat, the Indian cuisine is rich in vegetarian dishes. 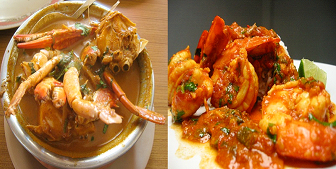 Indian cuisine is classified by its region of origin, which is further classified under the state cuisine.